Hands are for helping, learning, playing, and much more. Remind children of the many positive actions their hands can take, from saying hello to making music to brushing their teeth at bedtime. Children learn that violence is never okay, discover alternatives to hitting, and explore ways to manage strong feelings. Includes tips for parents and caregivers. 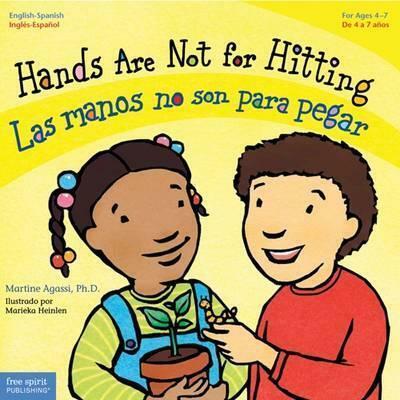 Martine Agassi, Ph.D., is an award-winning children's book author and creator of "Hands Are Not for Hitting," which inspired Free Spirit Publishing's Best Behavior series. As a behavioral therapist, she has extensive experience with counseling children and families in schools, residential facilities, foster care, and private practice. She has led workshops and group counseling in communication skills, parenting, drug and child abuse prevention, divorce, and self-esteem. Martine, her husband, and their daughter live in Las Vegas, Nevada. Marieka Heinlen received her BFA at the University of Wisconsin, Madison, and also studied at Central Saint Martins College of Art and Design in London. She launched her career as an award-winning children's book illustrator with the original edition of "Hands Are Not for Hitting" and has illustrated other books in the Best Behavior series and Free Spirit's Toddler Tools board book series. As a freelance illustrator and designer, Marieka focuses her work on books and other materials for children, teens, parents, and teachers. She lives in St. Paul, Minnesota, with her husband and son.